If your loved one has recently died because of another person’s negligence or recklessness, you may be wondering whether or not you have grounds to file a wrongful death lawsuit. Our experienced San Diego wrongful death attorneys at Rubinstein Law can help you determine whether or not you have a valid claim. Call us today at (866) 771-7181 to schedule a free case evaluation at our San Marcos office. Generally speaking, you must be an immediate family member of the deceased individual in order to file a wrongful death claim. This includes spouses, children, and dependent parents of the deceased. The state of California allows for certain exceptions to this rule, such as an unrelated minor who has lived in the deceased individual’s household for at least 180 days, and was dependent on him or her for at least one-half of their support. The death was caused either in whole or in part by the defendant. The death occurred as a direct result of the defendant’s negligence or recklessness. The death had a direct impact on you, and/or other surviving family members who qualify to receive compensation through a wrongful death case. The death resulted in financial damages (e.g. medical expenses, funeral expenses, loss of income, etc). This is merely a general outline, but it can be used to judge whether or not you have the basic framework of a successful wrongful death case. 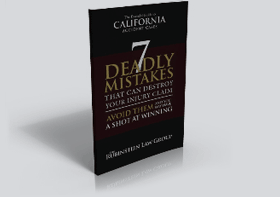 Negligence is the foundation of all wrongful death cases. In legal terms, “negligence” is defined as the failure to use reasonable care in a given situation. For example, a motorist driving recklessly or failing to obey traffic laws is considered negligent. In order to prove that the defendant in a wrongful death case was negligent, you must first establish that they were acting carelessly, and then show a direct link between their lack of care and your loved one’s death. Proving this can be complicated, requiring a thorough investigation into your family member’s accident, strong evidence, expert witnesses, and the skill of an experienced wrongful death attorney. If you have further questions about wrongful death law in California, please contact The Rubinstein Law Group today or call (855) 365-9955 today to schedule a free case evaluation with one of our experienced San Diego wrongful death attorneys. We can help you fight for the justice and fair compensation you deserve.